This system was rejected by the new schools that arose after the 10th century. Some writers of the new schools also cast doubt on the genuine antiquity of the 9 vehicles, and it does seem there was probably no real Indian ancestor. All of these classes of teachings may did exist in India, but bringing them together in this way, and particularly calling them all ‘vehicles’ seems to have happened in Tibet. Now the 9 vehicles appear throughout the terma (‘treasure’) literature, but modern scholarship tends to take the sceptical position that these texts should be treated as products of the time of their appearance, rather than of when they were said to have been concealed in the late 8th century. Transmitted literature found in the Kangyur and Tengyur and other canonical collections is more admissible as evidence, even though the attribution of authorship is often questionable. So among the transmitted literature we do have some works referring to the 9 vehicles, or something like them. From the 8th century there is The Garland of Views, which is generally accepted to have been written by Padmasambhava, or at least somebody from the same period (see the Tibetan text and translation in Samten Karmay’s The Great Perfection). There is another text supposedly from the same period, Explaining the Stages of the View, attributed to the early translator Kawa Paltseg, which does contain the 9 vehicles in exactly the same way as they are presented in the later Nyingma school, but for several reasons this looks like a later text falsely attributed to Kawa Paltseg. Then from the late 9th century we have Nub Sangye Yeshe’s Armour Against Darkness, his commentary on the great Anuyoga scripture Gongpa Düpai Do (the 9 vehicles are not explicitly presented in the root text). If these texts really do date from the 8th to 10th centuries, we ought to see some versions of the 9 vehicles in the Dunhuang manuscripts. Until the last few years however, all we have had is one scroll: Pelliot tibétain 849. This scroll has been known about since the 1920s, when a book-length study of it was published in France by Josef Hackin. The scroll contains a whole series of notes, probaby taken from the teachings of an Indian guru passing through Dunhuang. Among these notes is something similar to the 9 vehicle system of the Nyingma, but still with significant differences. Then a few years ago, when Jake Dalton and I were working on a catalogue of the tantric manuscripts in the Tibetan Dunhuang collections, we came across two more versions of the 9 vehicle system. Amazingly, both were more much more interesting and comprehensive treatments of the subject than the one found in Pelliot tibétain 849. In a very clear and methodical treatment, each of these is discussed in terms of its (i) view, (ii) meditation, (iii) practices and (iv) vows. This is an elegant and sophisticated little treatise. In essence there is little difference between the way these classes of teachings are described here and the description of their equivalents in classical Nyingma sources. The second “new” manuscript is IOL Tib J 644. Here the 9 vehicles appear in their entirety, exactly as they do in the later tradition. Again, the treatment is very systematic, distinguishing the 9 categories in terms of (i) their deity system, (ii) the relationship between deity and practitioner and (iii) the marks of accomplishment. Jake provided a translation of the complete text in his recent article “A Crisis of Doxography”. The only difference between this manuscript and the later tradition, and I suppose it is not such a small difference, is that the word ‘vehicle’ is never used in the manuscript to refer to these classes. This is significant in that some scholars of the new schools strongly rejected the idea of calling these tantric classes ‘vehicles’. Sakya Paṇḍita, for one, argued that Atiyoga should be treated as a manifestation of wisdom, but not as a vehicle in itself. The general tendency to refer to the 9 categories as vehicles seems to postdate our manuscripts, that is to say, it was not common until after the 10th century. 1. Dalton, Jacob. 2005. “A Crisis of Doxography: How Tibetans Organized Tantra in the 8th-12th Centuries”. Journal of the International Association of Buddhist Studies 28.1: 115–182. 2. Hackin, Josef. 1924. Formulaire sanscrit-tibétain du Xe siécle. Paris: Librairie orientaliste Paul Geunthner. 3. Kapstein, Matthew. “New Light on an Old Friend: PT 849 Reconsidered”. Tibetan Buddhist Literature and Praxis. Leiden: Brill. 9–30. 3. Karmay, S. 1988. The Great Perfection. Leiden: Brill. 1. Klong chen pa. Grub mtha’ mdzod [Treasury of Philosophical Tenets]. In the Mdzod bdun (click here for bibliographical references to the various editions). 2. Bka’ ba dpal brtsegs(?). Lta ba’i rim pa bshad pa [Explaining the Stages of the View]. Q.5843. 3. Gnubs Sangs rgyas ye shes. Sangs rgyas thams cad kyi dgongs pa ’dus pa mdo’i dka’ ’grel mun pa’i go cha [Armour Against Darkness]. Rnying ma bka’ ma rgyas pa, vols.50-51. 4. Padmasambhava(?). Man ngag gi rgyal po lta ba’i ‘phreng ba [The Garland of Views]. Q.4726. As I’ve shown in previous posts, the bodhisattva of compassion, Avalokiteśvara (Tib. Chenrezig) was popular in Tibet before the second propagation of Buddhism which began in the late 10th century. However the way Avalokiteśvara was worshipped in this early period may have been somewhat different. We associate Tibetan devotion to Avalokiteśvara so closely with the six syllable mantra (Oṃ maṇi padme hūṃ) that it is difficult to think of one without the other. Nevertheless it does seem that before the 11th century, the six syllable mantra was only loosely associated with Avalokiteśvara in Tibet. Among the many Dunhuang texts devoted to the bodhisattva, only two contain the six syllable mantra, and in both cases it is still not quite the mantra as we know it. In particular, it has more than six syllables. 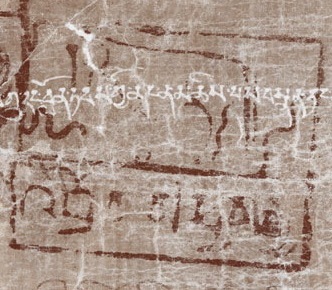 In one manuscript, a guide for the dying (Pelliot tibétain 420/421), the mantra is Oṃ maṇi padme hūṃ mitra svāhā. In another, a ritual collection (IOL Tib J 401), it is Oṃ vajra yakṣa maṇi padme hūṃ. And in all other cases, entirely different mantras are associated with Avalokiteśvara. Despite this lack of pre-11th century textual sources for the mantra, it might well have been gaining popularity through oral transmission. There is a story in the Blue Annals about a certain Latö Marpo (La bstod dmar po), who went to India in the 11th century to find a teaching to purify the negative actions he committed as a child. Latö found a guru who agreed to teach him a very secret mantra that would remove the obstacles of this life and provide enlightenment in the next. The guru, speaking down a bamboo tube inserted into the ear of the student, so that no-one could overhear, said “Oṃ maṇi padme hūṃ.” Latö immediately thought: “This mantra is recited throughout Tibet by old men, women and even children!” He had to perform some unpleasant acts of penance for having such doubts, but the story ends well. If true, the story suggests that the six syllable mantra was transmitted in India as a secret oral teaching, but had permeated deep into the popular oral culture in Tibet by the 11th century. This might have been accomplished by wandering religious preachers in Tibet, the forbears of those who later came to be known as maṇipas, because they spread a simple form of dharma which concentrated on recitation of the six syllable mantra. What really changed in the textual tradition was the appearance of the early treasure cycles (especially the Maṇi Kambum) which took the narrative of Avalokiteśvara from the Kāraṇḍavyūha sūtra and merged it with Tibetan creation myths to make Avalokiteśvara Tibet’s patron deity. And the Avalokiteśvara’s mantra in that sutra is of course Oṃ maṇi padme hūṃ. 1. Imaeda, I. 1979. Note préliminaire sur la formule oṃ maṇi padme hūṃ dans les manuscrits tibétains de Touen-houang. In Michel Soymié (ed.) Contributions aux études sur Touen-Houang. Geneva/Paris: Librairie Droz. 2. Kapstein, Matthew. 1992. “Remarks on the Mani bka ‘bum and the Cult of Avalokitesvara in Tibet”. Goodman & Davidson (eds. ), Tibetan Buddhism, Reason and Revelation. 79-93. 3. Roerich, G.N. 1976. The Blue Annals. Delhi: Motilal Banarsidass. 4. Stein, R.A. 1959. Recherches sur l’épopée et le barde au Tibet. Paris: Presses universaires de France. 5. Stein, R.A. 1970. Un document ancien relatif aux rites funéraires des Bon-po tibétains. Journal Asiatique CCLVII, 155–185. 6. van Schaik, S. 2006. “The Tibetan Avalokitesvara Cult in the Tenth Century: Evidence from the Dunhuang Manuscripts”. Tibetan Buddhist Literature and Praxis (Proceedings of the Tenth Seminar of the IATS, 2003, Volume 4), ed. Ronald M. Davidson and Christian Wedemeyer. Leiden: EJ Brill, 2006. 55–72. 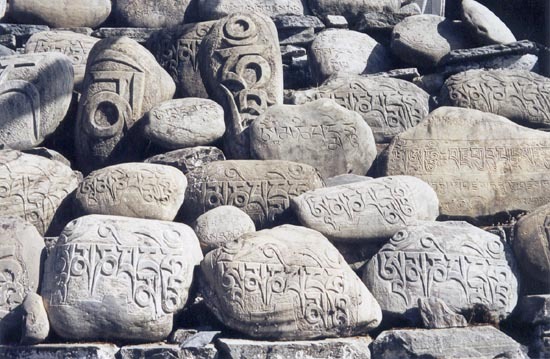 Stones engraved with the six syllable mantra. Courtesy of Indologica. The form with eleven heads called Ekādaśa-mukha (Zhal bcu gcig pa). The form with a thousand arms and a thousand eyes, Sahasrabhuja-sahasranetra (Phyag stong spyan stong dang ldan pa). The form holding a wish-fulfilling jewel and a wheel, known as Cintāmaṇicakra (Yid bzhin ’khor lo). The form known as “the unfailing noose,” Amoghapāśa (Don yod zhags pa). These forms of Avalokiteśvara are found among the Dunhuang manuscripts in dhāraṇīs, in hymns (stotra) and in practice manuals (sādhana). There are at least seven different Avalokiteśvara dhāraṇī texts dedicated to the eleven-headed form, the thousand-armed form, and the Amoghapāśa form. The dhāraṇī spells are mostly variations on a single theme, beginning Oṃ Āryāvalokiteśvarāya Bodhisattvāya Mahāsattvāya Mahākarunikāya. Many of these dhāraṇīs were also translated into Chinese, attesting to the popularity of these forms of Avalokiteśvara in China before they were eclipsed by the development of the female form of Avalokiteśvara. Conceptual signs will not develop. All accomplishments will be perfected. Among the practice manuals, we find or sādhanas based on the Yoga tantra Sarvatathāgata- tattvasaṃgraha. We also find a Mahāyoga sādhana with a red Avalokiteśvara and the goddes Pāṇḍaravāsinī as his consort. To sum up, Avalokiteśvara was an important presence in Tibetan Buddhism by the 10th century, as an object of devotion, a tantric deity, and a guide for the post-death state. Advocates of Avalokiteśvara in the later diffusion of Buddhism in Tibet, such as Atiśa, may have introduced new texts and forms of the Avalokiteśvara, but the bodhisattva was already well-established in Tibet before they began their work. Sam van Schaik. 2006. “The Tibetan Avalokitesvara Cult in the Tenth Century: Evidence from the Dunhuang Manuscripts” in Tibetan Buddhist Literature and Praxis (Proceedings of the Tenth Seminar of the IATS, 2003, Volume 4), ed. Ronald M. Davidson and Christian Wedemeyer. Leiden: EJ Brill, 2006. 55–72. Amoghapaśa sculpture. Nepal, 8th–9th c. © Nyingjei Lam. Digital photography is allowing us to read some previously unreadable manuscripts. Take for example IOL Tib J 834, part of a scroll that almost certainly dates back to the Tibetan occupation of Dunhuang (c.781-848 CE). The importance of this scroll is indicated by the silk lining that was used to strengthen the edges (visible in the image below). The scroll has become darkened by handling, or because of where it was stored before being placed in the Dunhuang library cave, so that some of it is unreadable. What makes it worse is that some of the writing and all of the seals stamped on the manuscript are in red ink, which is now almost invisible. Now, this scroll is a perfect candidate for infrared photography. Though infrared is not as magically efficacious as some believe (see these pages), it works very well with manuscripts that have darkened over time, and, of course, with red ink. As the infrared image below shows, we can now clearly see the seal on this manuscript, a rectangular seal containing a picture of a horse and (perhaps) a pasture? The writing underneath states that this is the seal of Drog (‘Brog), a word that means ‘nomad’, which fits rather well with the horse and pasture image. This raises another question. As Kazushi Iwao has kindly pointed out to me, this scroll is a land registry, that is to say, it parcels out land between different landowners. So why would nomads be involved with this kind of thing?